More Ocean-sized Errors in Levitus et al. | Watts Up With That? From every observed one-degree mean temperature value at every standard depth level we subtract off a climatological value. For this purpose we use the monthly climatological fields of temperature from Locarnini et a. .
Now, the “climatology” means the long-term average (mean) of the variable. In this case, it is the long-term average for each 1° X 1° gridcell, at each depth. Being a skeptical type of fellow, I though “how much data do they actually have”? It is important because if they don’t have much data, the long-term mean will have a large error component. If we don’t have much data, it increases the size of the expected error in the mean, which is called the “standard error of the mean”. The temperature monthly climatologies deeper than 1500 meters have not been calculated. YIKES! In 55 years, only 5% of the 1° X 1° gridcells have three observations or more for January at 1500 metre … and they are calculating averages? Now, statistically cautious folks like myself would look at that and say “Well … with only 5% coverage, there’s not much hope of getting an accurate average”. But that’s why we’re not AGW supporters. The authors, on the other hand, forge on. Not having climatological data for 95% of the ocean at 1500 metres, what they do is take an average of the surrounding region, and then use that value. However, with only 5% of the gridcells having 3 observations or more, that procedure seems … well, wildly optimistic. It might be useful for infilling if we were missing say 5% of the observations … but when we are missing 95% of the ocean, that just seems goofy. As you can see, there are still lots and lots of areas without enough January observations to calculate a standard error of the mean … and in addition, for those that do have enough data, the SEM is often greater than half a degree. When you take a very accurate temperature measurement, and you subtract from it a climatology with a ± half a degree error, you are greatly reducing the precision of the results. APPENDIX 3: A statistical oddity. In the course of doing this, I got to wondering about how accurate the calculation of the standard error of the mean (SEM) might be when the sample size is small. It’s important since so many of the gridcell/depth/month combinations have only a few observations. The normal calculation of the SEM is the standard deviation divided by the square root of N, sample size. I did an analysis of the question, and I found out that as the number of samples N decreases, the normal calculation of the SEM progressively underestimates the SEM more and more. At a maximum, if there are only three data points in the sample, which is the case for much of the WOA09 monthly climatology, the SEM calculation underestimates the actual standard error of the mean by about 12%. This doesn’t sound like a lot, but it means that instead of 95% of the data being within the 95% confidence interval of 1.96 * SEM of the true value, only about 80% of the data is in the 95% confidence interval. to be approximately correct, where N is the sample size. I wish to complain ! Who gave the approval, and the funding, for the Giants Causeway to be completed between Scotland and Ireland (clearly visible in Figure 1 and 2) ? At least there would be no `landfill tax` to pay for all the fill required. When you take a very accurate temperature measurement, and you subtract from it a climatology with a ± half a degree error, you are greatly reducing the precision of the results. To be exact, the error of the resulting anomalies should begin with that half degree error from the climatology and then add the error of the measurement, should it not? Successful scientists are just like successful business people. Err actually, vice-versa. Never trust the conclusion. Personally go to the raw data and roll around in it and work it up with your own eyes to understand the real picture. Good work as always. Where do you find the time? Very nice! My favorite posting of yours so far. I believe the important thing on the SEM is that when you calculate the 95% CI, you use a t distribution with probability 0.975 and n-1 degrees of freedom. If you have a lot of points, that comes out to around +/- 1.96 times your SEM. But with only three points, that comes out to +/- 4.3 times your SEM. If your SEM is a half degree, that comes out to +/- 2 degrees. 1. Why are the worst errors at 1500 m depth in the North Atlantic? 2. The standard error at the surface is much larger than at the 1500 m depth (note the color scales). I guess this is because the temperature is much colder down below? How do the relative standard errors (SE/mean) compare? Presumably they should be much smaller at the surface because of greater N, although perhaps larger because of greater fluctuations of the temperature? Microsoft has a couple of new videos related to the R language, for those interested. Well ahead of us, as usual, Willis. After reading the paper, I have additional issues with what looks like a serious lack of management oversight and quality control by NOAA. Examples in this paper are too numerous to fully document, but here is a sampling. Observation: Are we to understand that NOAA’s management really allows its scientific staff to bypass the agency’s own quality control process and use whatever data suits them? Observation: Lacking adequate data for in the 1750-2000 meter range Levitus uses the data anyway; because, he “hopes” to acquire adequate data in future research cruises? Since when are an Agency’s scientific personnel supposed to make conclusions based on data a senior staff member “hopes” to acquire data at some future time? Observation: This suggests there are significant drift problems associated with the NOAA’s salinity data. Since the author’s specific gravity (density) and specific heats are calculated from the pressure, salinity, & temperature data gathered, then one would think an error here would be cause for concern. After all, Heat content = Temperature x Density x Specific Heat x Conversion factors. Given Levitus’s brought up the issue, one would expect the he would discuss the significant “salinity” drift problem to the extent necessary to draw a conclusion or to satisfy a reader’s potential concerns. In view of the lead author’s own doubts; can one really conclude, with confidence, that NOAA’s calculated “heat content anomalies” are meaningful? Observation: Where the heck is the NOAA’s management and quality control oversight? Either the NOAA’s quality control officer can certify the “problems” have been corrected and cite internal documentation to that effect or not. Also, just when is a correction “for the most part” a satisfactory response? Observation: “We believe” “most” of the “egregious problems” have been eliminated? Any project manager worth his salt would require the author to state exactly which “egregious problems” have been eliminated and cite the documentation showing correction. Moreover, exactly what “egregious problems” remain and to what extent could they impact the papers conclusions? I understand this is a draft; but, this is the kind of sloppy work I would expect from an intern not a established professional. 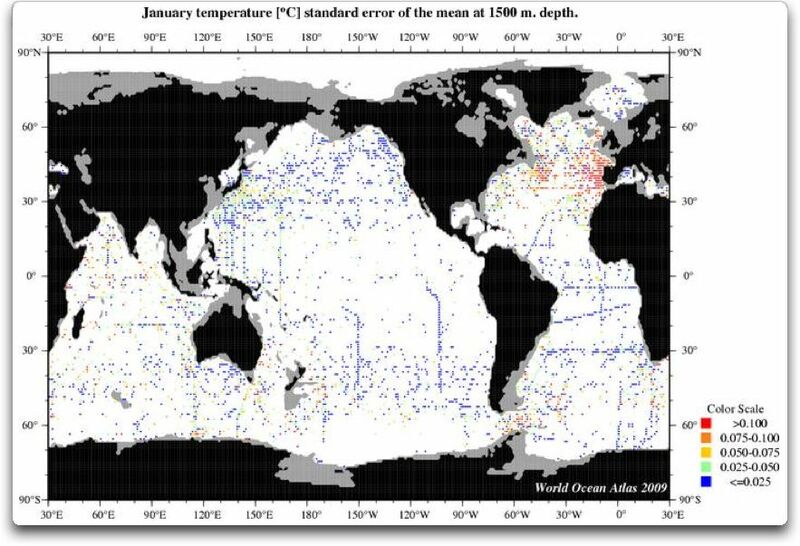 The standard error of the mean is a measure of the variability of the ocean’s temperature. So the north atlantic, where the Gulf Stream makes it alternately hot and cold, has a high SEM. The same is true about the surface, the variation is greater, so the SEM is greater. Didn’t the paper claim better than 50% coverage at that depth???? Guess it depends on your definition of “coverage”. What effect does changing the gridcell size have on the results? If the result is sensitive to a change in cell size, then this would argue strongly that the trend is not a true trend. Rather, an artifact of the methodology. Thanks Willis, this is amazingly little data. Is this all we have to compute Ocean Heat Content (OHC) from? How can one do that let alone calculate a trend? Hmm. perhaps you could use the more complete data to estimate the error associated with the more sparse data? -Calculate the climatologies given the sampled data. -rinse and repeat getting a number of climatologies based on subsamples of similar coverage to the sparse data. This would give you an idea of how big a deal it is to have sparse data. You could even get fancy and try to match up data in the sparse set with the full set, calculate the climatologies and compare that to the value using the full data. That is in some sense a point estimate of the error induced by using the sparse data, but I am not sure how good an estimate that would be. Probably not going to tell you anything you don’t know (the errors are big…), but might be interesting. How’s this for the naive question of the year? Why can’t our governments rely upon honest and highly skilled people like Willis for the kind of quality input sound public policy making demands? Instead we have people who are horribly hobbled by interests, ideology, ineptness and worse injecting what is certain to produce the most defective governance possible. Haha! I read that sentence too fast and thought you were planning to discuss the errors in the Book of Leviticus :). Can one of your more scientifically knowledgable and literate posters tell us what all these figures and graphs purport to mean? Does the original paper contend that the oceans are warming faster than nature intended? if so dangerously? Or is the warming (if accurately measured) merely consistent with the oceans recovering from the Little Ic Age? Cheers from now chilly Sydney – max. 20*C.
I don’t think that they have used the Argo data to create the climatology, because that would involve the splicing of two datasets. So we do have more data, but only for the recent period, and even that is sparse at depth. Willis did they at least correct for specific heat change at different density/level? Just curious. Possibly … but at say 2000 metres we have little data of any kind. In addition, for the climatology you don’t want to mix up Argo data with the earlier data, because there’s no guarantee that they agree. The short answer is, you can do it the way you do it, or the way they do it, and for me that might make sense if you had 80% or 90% of the data. But since we only have data for about 5% of the gridcells down at 1500 metres, that introduces an unknown error … and the reason we’re doing this in part is to establish the size of the error. Thanks again Willis. It takes one with your smarts and sweat to look into such papers. I am so glad you do. Good question, Evan. What the graphs are discussing is the difficulty of determining the error bars (confidence intervals) on the oceanic heat content (OHC). Without those, we don’t know how much the heat content is changing. To compute heat content at each gridpoint the specific heat and density were computed using annual climatological values of temperature and salinity from Locarnini et al. and Antonov et al. [ 2010]. I remain in awe of those of you who are not on a government payroll yet devote time and energy to reach for the truth. I applaud you all and am thankful that people like you exist. I was hoping you could confirm of refute how I was interpreting what the S.I. says about the std errors they used. It’s rather hard to digest and is confused by their equation using the symbol sigma to mean different things (at least according to the adjacent text). I did not manage to completely understand what they were doing because they got their equation from a text book that I don’t have and their description suggests that sigma means three different things in the same equation. That indicates that they are confused about what they are doing or are making undeclared assumptions that different statistics are interchangeable. Aside from the sigma problem, my reading of the S.I. was that when they did not have sufficient data they were using the SE from cells with lots of data. This would be blatantly wrong and could explain the puzzle you posed in the black-jack thread. They must be getting a SE form somewhere and it is not from the data because it is not there. I think this may be the key to the puzzle. PS I’m wondering whether they are confusing variance and std error. There would be some loose justification for assuming variance of adjacent cells is similar. But I get this impression that they are applying the std error from a well sampled cell to the single reading cells. Thus getting a totally spurious assessment of the propagated error which is the basis for their overall uncertainty. I do enjoy reading your posts, the clarity and humor backed up by really excellent scientific analysis. 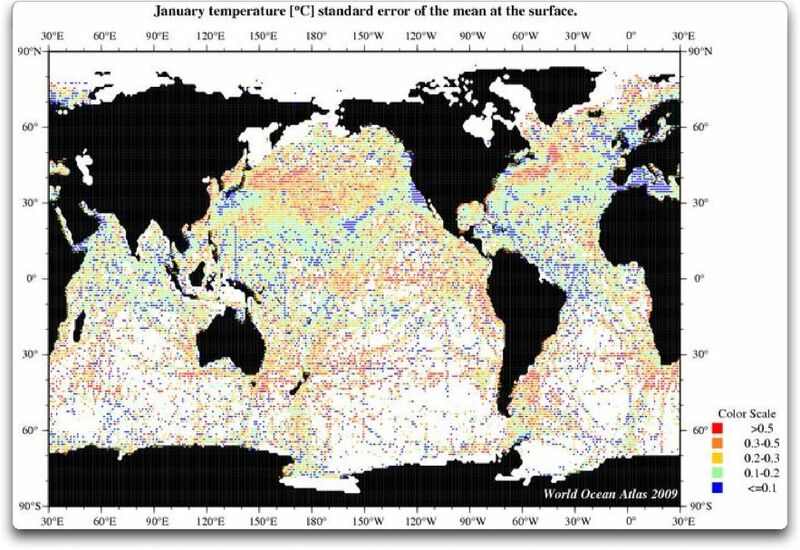 I’ve always wondered what average sea and land temperatures can actually tell us. How can the average temperature of the Sahara, which can swing from +50 to -5 centigrade in one day tell us anything? A temperature reading of the sea would seem from my nescient view to contain more warmth than the same temperature reading of land. I also don’t understand how the stored heat and cold in the oceans and ice caps affect an average temperature? I don’t see how it could be calculated. Taking various temperatures of the sea and finding an average seems to me to be like a color blind person trying to determine a single color of marbles in a box of multi-colored marbles which are constantly changing color. @Evan Thomas: If you see a measured number like 15 degrees, that’s only half the story. The other half of the story is the accuracy of the measurement. If I tell you that it’s 15 degrees outside, but my thermometer reads +/- 10 degrees, you wouldn’t really pay much attention to me. Similarly, if I do a statistical calculation and tell you the answer is 15 degrees, that’s only half of the story. What kind of variability would we expect around that number, given the model or procedure I used? Even if my measurements are +/- 0.01 degrees, if my statistical procedure introduces an additional uncertainty of +/- 2.5 degrees I need to acknowledge that my total uncertainty is more than +/- 2.5 degrees and not tell people that it’s +/- 0.01 degrees because my thermometers are so accurate. In the paper Willis is discussing, there are (at least) three sources of variability: 1) how accurate are the measurement devices, 2) since they’re taking averages, how much variability is there in the average, where they do have data, and 3) how much data do they have and how well does it represent the huge ocean (i.e. how much data do they NOT have)? Each of these sources adds more uncertainty to the final answer. If you only have three readings for one area of ocean and you take the average (assuming the thermometer has zero error, which is obviously unrealistic), that average will have a large variability/uncertainty associated with it. As I mentioned in a previous post, when you average three temperature readings and the standard error of that mean is 0.5 degrees, you would say that the 95% confidence interval around that average is about 2.5 degrees. That is, at a commonly used standard of statical certainty, the actual average temperature at that location could be 2.5 degrees warmer or cooler than the calculated average. And that’s just at that measured point. If we try to make statements about average temperatures 100 miles away, whether about the average temperature based on the closest average temperatures, things get even more complicated. BOY, what a shell game! Now you see the thousands of data points we base our error bars on and now you don’t. I immediately wondered where all this extra heat came from. Even the most dire assessments of CO2’s ability to trap long wave radiation couldn’t account for more than a fraction of the energy added to the deep oceans. Obviously there are forces in play that utterly dwarf GHG’s effects. They also voice the conviction that part of this hidden heat will meander back to the atmosphere and global warming will resume. My question is how they can possibly know, since this is supposed to be “science”, how that will happen. Clearly there is enough energy there to devastate the planet, so if there is a mechanism that will release it, then we might as well pack our tent and go home. We’re not going to chase away 36C of warming by taxing carbon. Roughly half of that energy was accumulated in just the past 20 years, so presumably it could be released in a similar time frame. None of this passes even a cursory common-sense test. A vast amount of energy is discovered to be accumulating in the deep oceans, so if that’s true then GHG’s are the least of our worries. The planet seems to have narrowly averted catastrophe from some unknown influence, and the oceans seem to have shielded us from a disaster of incomprehensible proportions. Somehow the relatively tiny effects of CO2 have been hidden there as well, and that portion of the heat (and only that portion) will eventually be returned to the atmosphere? This sounds so ridiculous that I can’t help but think that I missed a fundamental part of the analysis. I haven’t read the whole paper and haven’t looked at much beyond the scale of the energy they claim to have found,so perhaps some of this is explained by them. That’s because it is ridiculous. All that is saying is the heat capacity of water is hugely bigger than air. That fact would not shock or surprise anyone. The catch is the “if”, because this heat will never be released quickly, there’s no reason or mechanism by which it could happen. 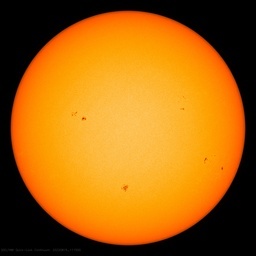 In fact, this is GOOD news and rather reassuring, what it means is that we have some storage heaters that will be able to slow the cooling of the atmosphere during the next 20 or 30 years of solar minima. This is a main part of the reason why our climate is so stable and why we are here to talk about it. The engineer in me has a question – what is the reference condition for zero energy? The freezing point of water? If so, have they corrected for salinity and pressure/depth? The statement that the ocean contains “X 10^22 Joules” is meaningless unless you define the reference point. If I set the reference point high enough, the delta over time looks huge. If i set the reference point low enough (say absolute zero), then small changes in temperature mean small changes in “heat content”. On some of the unaccounted errors and flawed methods. Please refer to the paper linked at the head of the article (line numbers help to find the text). We exclude the “first guess” value AND it’s uncertainty , which never gets mentioned or taken into account. This uncertainty must be as large or larger than the current study since it comes from an older one when less data was available. In doing the difference you should add arithmetical errors. Instantly their uncertainty is less than half what it should be. The equation 4 shows how to calculate the compound error based on standard deviations of each element. HOWEVER, this requires a sufficiently large sample at each point to derive a valid statistic. There must be enough data for the presumed gaussian distribution of the errors to be accurately represented. You cannot use the S.D. of one reading (ie zero) as an estimate of it’s uncertainty. The authors recognise this problem but the way they get around is by gross simplification and inappropriate substitution of other SD numbers. So here they substitute SD of data within each cell with the SD of the *cell averages* . This is near to meaningless. They are in no way equivalent. In this way, a one off reading which could be far from the true average of a 100km x 100 km by 100m deep slab of ocean is deemed to have an uncertainty of temperature equal to the SD of the of the means of the surrounding cells in the “influence region”. How can the number of cells in the region determine the accuracy of our one reading as a representation of the its cell? If it has more neighbours does it become more accurate ?? And this is not just some odd-ball peculiarity I have pull out to be awkward, as Willis points out this is the median situation: the most common case. So after all the heavy duty , scary looking maths they wave at the reader they end up throwing it all out of the window and making a trivial and inappropriate substitution. The still impressive equation 7 simply reduces to σa = k x σ0 , where k is a sum of all the weighting of the nice gaussian they initially said they were going to use for weighting. In reality we see they don’t . I have not calculated that sum but if it does not end up being equal to one I’d want to know why not. The weighting they don’t even use should should not affect the result ! The next processing stage seems to be more legitimate except that it is meaningless if the values from the first stage are not valid. So the bottom line is all fancy maths is a farce. They are not accounting in any way for the uncertainty in using single samples to represent large volumes of ocean and they are totally ignoring the certainly larger uncertainty in the “first guess” values. Are they being deceptive? I don’t know. I suppose the other possibility is incompetence. For a given gridcell(cube) the sample size is very small with respect to spatial variance; therefore for each cell we must use the Student’s t distribution functions (dependent on the number of samples and confidence required) to estimate a particular cell’s confidence interval at the time of measurement. This states that the ½ confidence interval equals the t-distribution value times the sampled standard deviation divided by the square root of the number of samples. For example let’s say a cell has three concurrent samples values of 285.00(Kelvin), 286.00(Kelvin) and 287.00(Kelvin). The mean is (285.00+286.00+287.00)/3= 286.00K. The sampled (though not necessarily the true) standard deviation is (((285-286)^2+(286-286)^2+(287-286)^2)/2)^0.5 = 1.00K. 95% confidence corresponds to a probability of the mean temperature falling outside of the confidence interval of 0.05. Using a Student’s t- table, degrees of freedom = #samples -1 = 3-1=2. The t-distribution from the table @ 2 degrees of freedom and .05/2= .025 is 4.303. The estimated ½ confidence interval is the t distribution times the sampled standard deviation divided by the square root of the number of samples. This is 4.303*1.00K/(3)^0.5 = 2.48K. In other words, with only this data in hand, the best estimate @ 95% confidence is 286K +/- 2.48K. Likewise @ 90% confidence the result would be 286K +/- 1.69K. So even if you had hundredths of degree accuracy on the measuring device, your precision is wiped out by the spatial variance combined with low sample size. If your other cells have similar sample sizes and standard deviations, further processing to get the global average won’t improve the approximate size of this error. Now let’s work this backwards; we want to guess how many sample sizes we need to get +/-0.1K @95% confidence. We don’t know the number of samples yet so we have to estimate using an initial guess and our low sample size data. I’ll assume the sample size is large (>30) so we get to use the normal distribution, using 1K as an estimate for standard deviation we get an estimate of (1.96*1K/.1K)^2 = 384 samples (in that grid cell at that time). So if you have a standard deviation of 1.00K and you want to achieve +/-0.1K @95% confidence, based on the three samples we took we estimate that we will need 384 samples to achieve that! Willis my question to you is: what do the real world ARGO standard deviations and sample sizes per grid cell look like (on average)? Is that something you can calculate easily with the given data? We could obtain an estimate for spatial sampling error by using the average sample size per cell and the average standard deviation per cell (all for a given sample time) and running it through this process. This would provide a minimum spatial sampling error estimate (we would actually expect it to be larger). We could also make a minimum guess on how many samples would be needed per cell per for a given timeframe. What we are looking at is the change in the ocean’s heat content, not the absolute heat content. As a result it doesn’t matter what we take as the reference condition. If the next year the relevant volume (e.g. 0-2000 metres depth) is warmer, and we know the volume, we can calculate the change in heat content from year 1 to year 2. Fascinating analysis, Hmmm, very interesting. Regarding your question, there is a variety of standard deviations and sample sizes in the Argo data depending on the year in question, the location, and the size of the gridcell. See my earlier articles on Argo for more information on these variables. The problem I see is not so much with the Argo data, it is with the “climatology” data. They use very little Argo data for the climatology, in order to maintain continuity. This is almost all old-school, drop the thermometer overboard on a line data, and as my maps above show, there’s not much of it, particularly at depth. Since all of the data (including Argo and XBT data) has the climatology subtracted from it, and since the errors in the climatology are much, much larger than in the Argo data, the error amounts are ruled by the climatology errors and not the Argo errors. Hmmm , good reply Hmmm. Here’s what Willis posted in the other thread about the supposed accuracy expressed as temperature equivalent. So if you have a standard deviation of 1.00K and you want to achieve +/-0.1K @95% confidence, based on the three samples we took we estimate that we will need 384 samples to achieve that! So in order to get the claimed level or accuracy you’d need a couple of gazillion data points for each cell. That gels with an intuitive idea of how difficult it would be to get that kind of accuracy and Willis’ statement that incredulity is sufficient to dismiss such a fanciful claim. Now to be realistic in 100m of ocean over 100km x 100km you must be looking at of the order of 10 kelvin temperature range. You can be “95%” certain your one reading is within that range. Who needs actual valid data when you have faith and models . Hmmm, says: Using a Student’s t- table, degrees of freedom = #samples -1 = 3-1=2. The t-distribution from the table @ 2 degrees of freedom and .05/2= .025 is 4.303. What does the table say for #samples =1 ie zero DF? That is the dominant case here. I immediately wondered where all this extra heat came from. Even the most dire assessments of CO2′s ability to trap long wave radiation couldn’t account for more than a fraction of the energy added to the deep oceans. Obviously there are forces in play that utterly dwarf GHG’s effects. I think JohnH’s logic is correct here – this all fails the commonsense test. I look forward to some further replies to JohnH’s thoughts. The more I read this paper the more concerned I get. The way I’m reading this the authors did not actually calculate the heat content (enthalpy) of the water at each depth with the passage of time. Instead they assumed that the salinity, specific heat (heat capacity), and density did not change over time. The only variable they changed was ocean temperature. As a chemical engineer, that series of assumptions gives me considerable heartburn. I see two core problems. First, it is not reasonable to assume that the salinity will remain the same at a given depth with time. Second, the thermodynamic properties of salt water vary considerably with salinity. In particular specific heat (heat capacity) and enthalpy. Of particular concern is that the heat capacity of salt water varies so much with salinity that I don’t feel it can be treated it as a constant when calculating changes in the enthalpy (heat content) of sea water. This implies there are “significant drift problems” with the salinity data. To get a rough idea of the potential for error I selected a temperature of 10C to evaluate. I selected 10C largely because this is roughly equivalent to the temperature of sea water at depth of 600 feet and because using the value minimized the amount of interpolation needed. For simplification, I ignored adiabatic cooling with depth (largely because the data I had handy is at atmospheric pressure). Now a 1.8% error for a 1 ppt change is cause for concern, because, ocean salinity varies by 32 to 37 ppt and can be as low as 16 ppt in the black sea. As a check, I also calculated how much of a salinity change would be needed equal the entire 0.09 C temperature change proposed by the authors. Noting that a decrease in salinity will result in an increase the ocean temperatures with the same ocean heat content. As a final check, I recalculated the figures above on a volume basis, after taking density variations with salinity into account (data not shown). The figures above did not change significantly. From the above, it appears that the authors failed to properly take salinity’s impact on heat content and enthalpy into account. Coupled with the author’s stated concerns regarding “significant drift problems” with the salinity data… well it leaves me with serious doubts. Couple this with Willis’s concerns, and… the whole thing appears to be a real mess. Now I’m not saying that the world’s ocean are becoming more dilute. But, I do think it is reasonable to say that ocean salinity varies widely at a given location with depth and time and that these measurable changes should be taken into account. Furthermore, I think it would be reasonable to suggest that annual Ocean Heat Contents (OHC) should be calculated from the enthalpies derived using the temperature, pressure, salinity values captured by the individual instrument and not by concocting questionable values and calling them “heat content anomalies”. P.S. There is always a possibility I’m miss-interpreting Levitus approach or I’m missing something fundamental. Please let me know if you see a flaw in my analysis. The World Ocean Atlas 09 search function is your friend in this, the following graphs are from there. Other than in small enclosed areas (that are not studied by Levitus), salinity in the ocean varies from about 36 psu in the North Atlantic down to 34 in the North Pacific. That would make a difference of about a quarter of a percent in specific heat at 10°C. However, the change in any one location over a year is small, with a standard deviation in the most variable areas of 0.3 psu. So I’d say they are justified in using the climatology rather than the actual measured salinity for a given month and depth level, since the error is quite small. The larger problem, of course, is the lack of climatology data for much of the world, getting worse with depth. Finally, thanks immensely for the Properties of Water pdf, I’ll use that a lot. Exactly. So what this study is doing is trying to use statistical methods for evaluating measurement uncertainty where no statistics are available for most of the data because it’s too spare. The authors recognise the problem but carry on anyway by substituting statistics from the next level up , variation between the averages of adjacent cells. Imagine a region of 5 x 5 cells, 24 of which are very well sampled and all have a std deviation around , say, 1 degree. The central cell has just one reading. In the absence of any better information, let us assume that real temperature variations in all these cells are similar. What do the statistics of those cells tell us about the accuracy of our problematic single measurement. The SD of those cells are the sampling errors of those cells , they do not even hint at how representative out single reading is of its cell. The most we could get from heavily sampled surrounding cells would be the total range of individual readings. This could give a first approximation to the range of temperature variation in our central cell. Thus half this range would be a guess at the +/- sampling error in the single reading. Note this has nothing to do with the SD of sampling within the surrounding cells and even less to do with the SD of variations *between* the cells which is used in the study. The pretence at estimating the confidence levels is just that, thought it’s hidden deep in pseudo-mathematical mumbo jumbo that would confuse all but the most determined and qualified reader. It’s not my job to redo this work for them, but it’s clear from all they leave out that a more realistic uncertainty estimate would be at least an order of magnitude greater than that which they present. Thanks, I appreciate your input and it is always valuable to get another perspective. Just input the above in Goggle and pick the PDF entitled “Thermophysical properties of Seawater”. In the back of this paper are ten tables containing familiarly straight forward equations for calculation the thermodynamic properties of seawater. These equations may be a more usable source of data than are the tables. I reviewed your response and generally agree; however, a closer look at the NOAA’s salinity data for shallow depths only re-enforces my doubts. More on this in a minute. Would I be correct in stating the standard deviations in the CY 2009 chart you provided (July @ 500 meters) would indicate the average standard deviation at a given location is below 0.05 psu – as opposed to being the upper limit of greater than 0.3 psu provided in the chart? My figure is roughly in line with your 0.04% estimate. So, I would generally agree with your assessment at the 600 meter depth. A further check of the 2005 to 2011 salinity anomalies at the 600 meter level suggests the low standard deviation pattern you alluded to is common within individual years and generally between years. This provides additional perspective with which to concur with you regarding the enthalpy calculation in the 600 meter range. (With caveats to be discussed below). However, I also noted that NOAA’s salinity anomalies vary considerably in the 50-200 meter range – particularly between individual years. For example, if one picks the 100 meter chart, fixes ones gaze at particular spot, and then scrolls through the years – one can easily encounter 0.3 to 0.4 psu changes in the average annual salinity at a given location from one year to the next. Lets say 0.3 psu for the purpose of this discussion. Now I suppose one could assume that the average of these shifts will even out with time. But… an examination of NOAA’s 100 meter 1955-1959 pentadal salinity anomalies compared to those for 2007-2011 show there really isn’t a consistent pattern. For example, the 2007-2011 data shows the Atlantic Ocean with a widespread increase in salinity where as the 1955-1959 data shows much lower levels. A similar reversal shows up in the northern latitudes. And the center of the Pacific Ocean is relatively saline in 2007-2011 and relatively fresh in 1955-1959 . So I’m having a tough time buying into the use of the climatology as a substitute for actual salinity data. Keep in mind, that the increased salinities showing up in the Atlantic, Pacific, and Arctic Oceans in 2007-2011 would actually lower the energy storage potential of those oceans (at the same temperature). This occurs because increased salinity decreases the seas enthalpy at the same temperature. The change of enthalpy with a unit of salinity = 1.4 kJ/kg- psu. The short version is that the potential for systematic errors in calculating heat content are relatively high near the surface and drop with depth. Using a climatology salinity value as a substitute for the actual values would be OK if the Oceans were stable with no long-term variations in salinity at a given location with time and depth… but I don’t see this in the raw data. I see significant variations in both salinity concentrations and ocean anomalies patterns with time – particularly at shallow depths. So how does this perspective relate to Levitus? Levitus’s Figure 2, shows that the bulk of his proposed energy storage is occurring in the ocean’s upper layers – at precisely the depths where the greatest chance for systematic error exists. And the potential for systemic error decreases with depth – along with Levitus’s decreased storage – until about 1550 meters below which the apparent storage virtually ends. This 1550 meter point is also the depth where salinity appears to become relatively constant with over wide areas. To summarize, I see where you are coming from with regard to a low potential for systematic error at great depth. However, I still see potential to systemic error begging at shallower depths and decreasing with depth. In the end it I think is really comes down to a matter judgment. If one believes that any variations in salinity at shallow depths will, statistically, follow a uniform pattern with time. Then there is no need for concern. However, if one sees shifting patterns, apparent oscillations, and/or changing trends in ocean salinity; then this would lead to a different perspective. Personally, I think it would be better to simply take the time and energy to calculate the Ocean Heat Contents more rigorously… to simply to remove doubt. Many thanks, Kforestcat. It’s an interesting analysis. The problem, I suspect, is that for many of the temperature measurements, they don’t have any contemporaneous co-located salinity data. After all, not every ship doing temperature soundings was also taking samples for salinity. This is particularly true back in the day when there was no way to measure salinity electronically, it had to be done with a chemical analysis. So that’s likely why they are using the climatology for salinity, it’s all they’ve got. And I can live with that, it’s just one of the many things that increase the error in any analysis. My problem is that I don’t see a term for that in the error analysis … they take the climatology as a given, near as I can tell they don’t consider it … but it definitely increases the likelihood of a systematic error. Subject: Typos/errors in my previous post. Regarding my April 25, 2012 post at 4:49 pm. My conclusions remain the same. So, sorry for this and other typos (extra words, wrong words, etc.) I suffer from a form of dyslexia that makes writing/editing difficult. Normally, I set aside documents and edit/error check the next day. I think the biggest problem with Levitus’s error estimates is the huge reduction in sample size caused by autocorrelation. I analysed the 1955-1995 trend estimate for the Levitus 2005 0-3000m dataset last year. A simple regression on the overlapping pentadal estimates gives a trend of 0.3294 and a standard error of 0.0370, both in 10^22 J/yr, with a t-value of 8.902 and a probability of the actual trend being zero of only 7.80x 10^-11. But the AR(1) autocorrelation coefficient is over 0.89, reflecting inter alia the data being over overlapping pentads. That reduces the efective degrees of freedom in the regression from 38 to 2 (using the (1+AR1)/(1-AR1) Quenouille correction). On that basis, the standard error is 0.16 not 0.037, implying a 9% probability that the true trend is no more than zero. I doubt if the trend error position is that much better for Levitus 2012, since it presumably uses much the same pre-Argo data as Levitus 2005. Couldn’t agree more, and it’s just one issue among a bunch. The new equations of state include thermodynamics properties of: seawater, ice, and humid air. These equations were endorsed in 2009 by UNESCO in Paris for all its member states as an international standard for oceanography, to be valid from 2010 on. The source code provides examples with which to check calculations. So there is a way to verify the code is working properly. Versions are available for Mathlab, Fortran, C, and VB. Once installed, it makes getting seawater data a breeze. Note that is also includes a database for converting preformed salinity to absolute salinity. Basically, just input the preformed salinity, sea pressure, latitude, longitude and out pops the absolute salinity. Please note, in this library, the enthalpy of seawater is calculated from the absolute salinity. Fascinating stuff, Kforestcat, many, many thanks.